Walnut Cheese was founded in 1932 as a market for the milk produced by surrounding dairy farmers. Today there is a daily production of 50,000 pounds of milk into cheese. We produce Colby, Longhorn, Muenster, Havarti, Pepper Jack, Calico, Cheddar, Mozzarella, Fresh Mozzarella, String Cheese, Cheese Curds, and many flavored Cheddars, Muensters and Cheese Spreads. We have kept the tradition of blue ribbons for our cheese at the Illinois State Fair for over 50 years. In 1964, we formed Avanti Foods to produce Gino's frozen pizza. 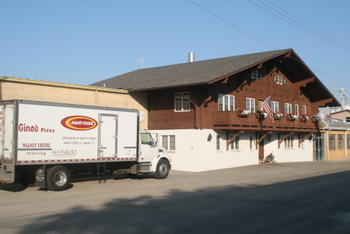 Our authentic Swiss Chalet built in 1964 is home to our offices and Cheese & Specialty Gift Shop. BLUHAVEN FARM, owned and operated by Darin & Keri Blunier and their 7 children, produces healthy, high quality produce and popcorn. The Bluniers have been in the homegrown popcorn business since the early 1970's and added produce in 1999. We work to improve soil health and quality produce by using crop rotation, integrated pest management, hand cultivation, and composting. We strive to produce the highest quality produce and popcorn using biological and natural methods. Our popcorn has been a family tradition for over 30 years and is grown using traditional methods. Our popcorn is naturally dried, and we hand clean each ear of corn because no pesticides are sprayed on the corn. This assures the best possible quality of our product! The mouth-watering aroma of something delicious baking—yeasty fresh bread, sweet cookies, spicy cinnamon rolls—conveys the mind to thoughts of a more peaceful time and place. For generations our family has enjoyed not only the fragrance, but the flavor of freshly baked breads, rolls, and sweets. Now we would love to share this flavor of homemade goodness with you to rekindle those past memories, or to give you the opportunity to start a new taste experience. All of our baked goods are made from scratch using fine, fresh ingredients and special care, so you can enjoy truly homemade goodness—fresh from our home bakery. Gardening is another activity our family has enjoyed through the years. 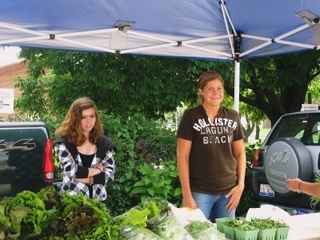 We are also glad to offer at the market naturally grown vegetables and flowers, fresh from our garden. The Cookie Shack is a family owned and operated business located at 3034 N. Wisconsin. 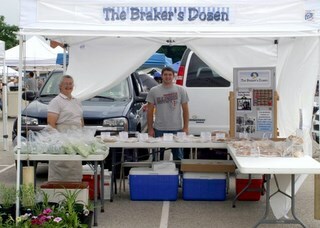 Owners, Brenda and Lee Ware, will be selling made from scratch cookies, cakes, brownies, cinnamon rolls, and breads. "We are a bakery that is community oriented. We offer baking classes and cookie decorating sessions for groups and families. We particiatpe in other events such as the Taste of Peoria, Taste of Bradley, Raphsody in Bloom and Bark in the Park." 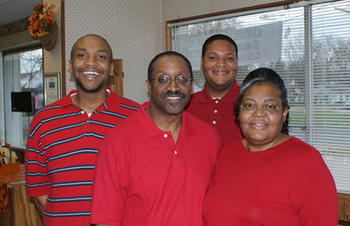 "We are a family dedicated to making sure our customers are more than satisfied with our baked goods and service!" Miseon and Dan Grillot live on 21 acres of rolling timberland near Copperas Creek outside Glasford, a location they call "our little piece of paradise." At the end of a long gravel road, their land is both botanical garden and production agriculture, everything arranged with an eye for aesthetics and grown without chemical pesticides. Here is where they raise flowers for the strikingly beautiful bouquets they sell every summer at Peoria's RiverFront Market. No two bouquets made by Miseon Grillot are ever the same, and bouquets can include combinations of annuals, hosta leaves and perennials that convey the vibrancy of a wildflower meadow at high season. Garden Spot is your green light to healthy living. 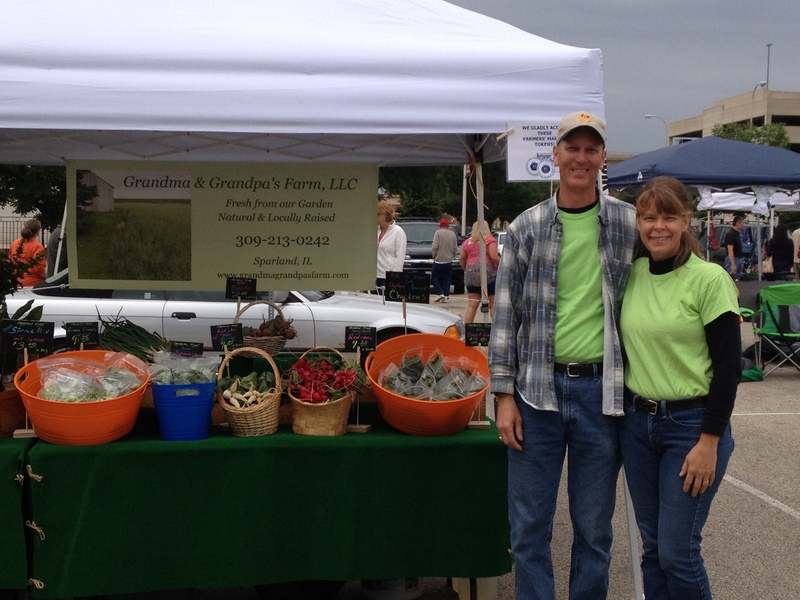 We are 5th generation local growers. We specialize in a variety of flavorful heirlooms, raised organically on 30 acres, one mile west of Princeville on Rt 90. We have been serving Peoria and surrounding communities with our fresh produce since the 1930's. We recently expanded our business to provide local restaurants and other establishments with our healthy organically grown produce to better our community. We appreciate your business! This summer, we welcome back Ginger & Tony Malek to the RiverFront Market. Our farm is a 4th generation farm, located in Sparland, IL. Hence the name--Grandma & Grandpa's Farm. We have recently moved back from Orlando, FL to revitalize part of the farm in a new way, to hopefully, preserve the farm for generations to come. Our mission is to provide home grown nutritious food to our community and be a friendly, fun and educational farm to visit. Our farm is based on the love of people and preserving the land and community around us. 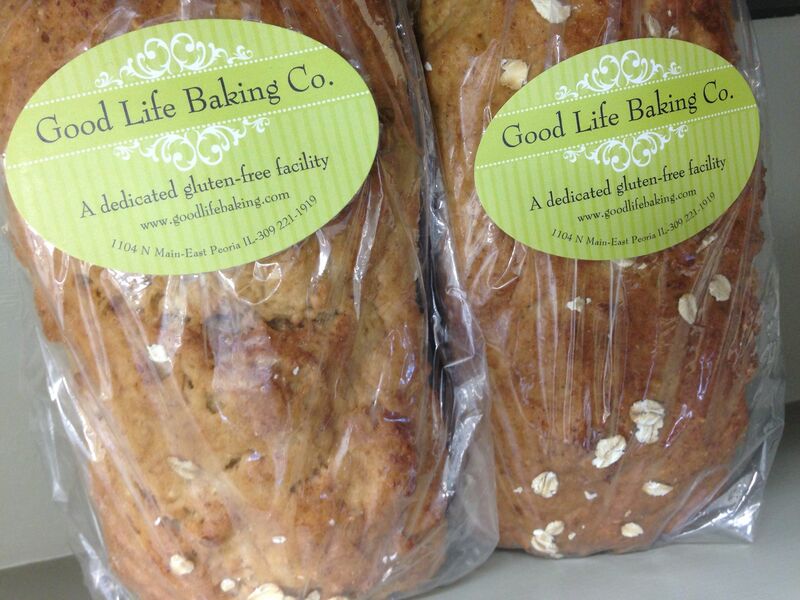 Great Harvest Bread......Served With A Side Of Purpose! Our purpose and passion is to provide you and your family with the freshest and most flavorful baked goods you’ve ever tasted. Stop by for a free slice of our freshly baked bread or a taste of our legendary sweets. We’re family owned and community focused. Green Acres Herb Farm is owned and operated by Don and Caroline Schertz, who started the business on the family farm in 1990. We offer more than 400 varieties of herbs, flowers, and heirloom vegetables, including 40+ varieties of heirloom and open-pollinated tomatoes. Located at 1675 County Road 1200E in Lowpoint, Illinois (between Metamora and Washburn), the farm welcomes visitors to our on-site farm shop and fields. 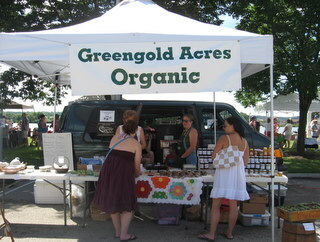 For more information about visiting, go to www.greenacresherbfarm.com or call Abby at (309) 251-9612. Featuring free range brown eggs (come early!) and chicken, grass fed beef, organic fruits and vegetables, fruit pies, and berries. Lyndon Hartz of Hartz Produce, located in Wyoming, IL, brings a huge selection of fresh produce to the RiverFront each week. 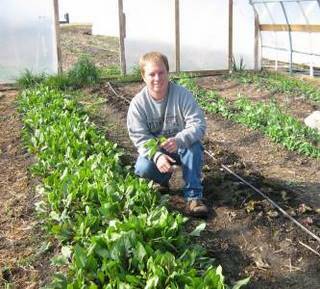 "Everything on my farm is grown in an environmentally sound way. No synthetic fertilizers, pesticides or herbicides. I use rotations, cover crops, legume crops, compost and fish/seaweed based fertizers to build the soil that feeds my crops. I believe now is the perfect time for this country to move away from an industrialized food system that is broken and return to a local, earth-based food system that builds soils naturally." Owned by husband and wife team, Brian & Jamie Knoll, JAVA & Co offers syrups and sweet shoppe items made from small batch recipes, hand made and hand packaged. JAVA syrups are a new, innovative product made from fresh roasted coffee beans without corn syrups, fillers or added preservatives. The results? Pure, decadent flavor! Check out JAVA's full line including boutique bottled Coffee Infused Syrups in 5 signature flavors, handmade biscotti, whole bean coffee, JAVA Snack Bars, Granola Nibbles, JAVA Spice, JAVA JAX- Hearty Pancake Mix, and Handmade Caramels. Featuring locally grown fruits and vegetables and made-from-scratch bake goods. Stop by for Pat's famous pies, strawberries, sweetcorn, berries, pumpkins, mums and much more! Organic Pastures, owned & operated by Larry & Marilyn Wettstein, is a third generation, small, organic family farm with rolling pastures, lush with a variety of grasses and legumes, located in Eureka. 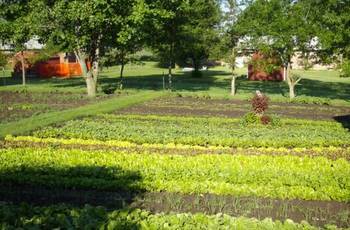 "We choose a farming method that improves and builds the soil surrounding the plants and animals. No antibiotics or hormones are used and all the livestock are raised the old fashioned way - outside in the sunshine, with a shelter but not confined in a building. We truly believe that as stewards of the soil, it is our responsibility to provide the healthiest food available. All our farming practices are based on sustainable agriculture and are organically certified in accordance with the National Organic Program standards." A variety of certified organic beef, pork, lamb and chicken meat packages will be available at the market. We personally schedule all our meat for processing at a small local facility that meets all USDA organic requirements. You will taste the difference! 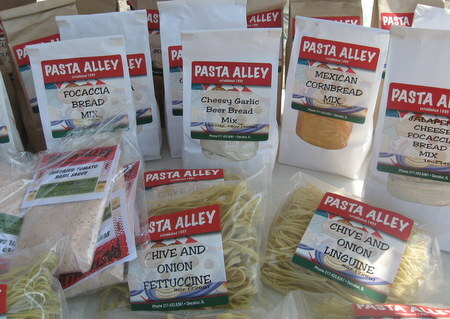 Pasta Alley is a family owned pasta business from Decatur. Not only does this company make dozens of varieties of noodles, sauces, breads, oils, and soups, but they dish up something else unique to community members. "We employ developmentally disabled people that were worried about not having jobs and that, and that's why we developed the business. They're able to do our packaging and labeling for us and it's a win, win situation for everybody," said Rae Anne Maupin, Mother of Pasta Alley owner. Pasta Alley employs up to 60 developmentally disabled adults, ranging in age from 21 to 78. At times they offer up to 42 varieties of pasta noodles, 10 kinds of breads, 9 soups, and 5 types of dipping oils. For more information go to www.pastaalley.net. Plow Creek Farm is a diverse, organically managed (we farm according to organic principles but are not organically certified) farm located just outside Tiskilwa. 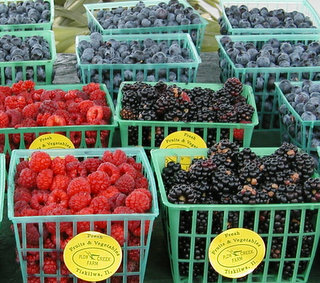 In addition to selling our products at farmers' markets, we also offer U-pick strawberries, blueberries, blackberries, and raspberries. We strive to grow top-quality berries and produce while being good stewards of the soil through sustainable agriculture and animal husbandry. Plow Creek Farm has been around since 1980 and is committed to offering our customers delicious, healthful, pesticide-free berries and produce. My goal is to provide Certified Naturally Grown produce of the old "Heirloom Varieties" from Organically Certified Seed whenever available. I am attempting to accomplish this by using the Spin (Small Plot Intensive Relay) Farming Method of planting. In using this method, there is a freshly harvested supply of produce for each market week, and this keeps the crop rotation active for the best soil health. Only certified, all natural fertilizers are used along with all natural, mostly home made compost.